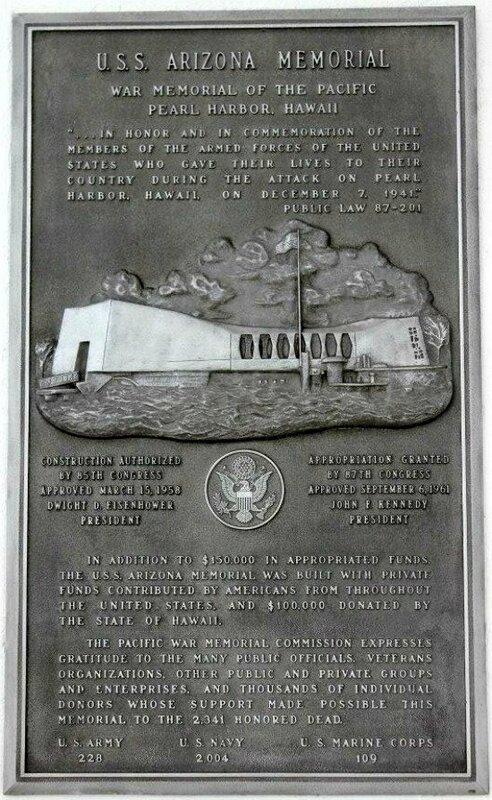 I wasn’t there on December 7, 1941. 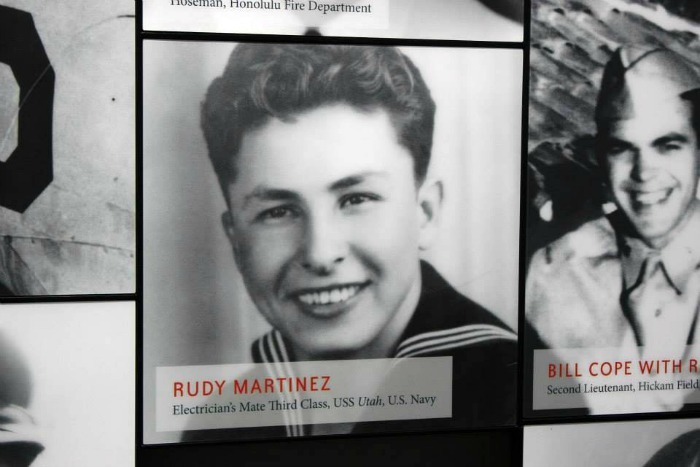 I wasn’t even a born yet and I wouldn’t be born for another 44 years but I’ve always felt a connection to Pearl Harbor. 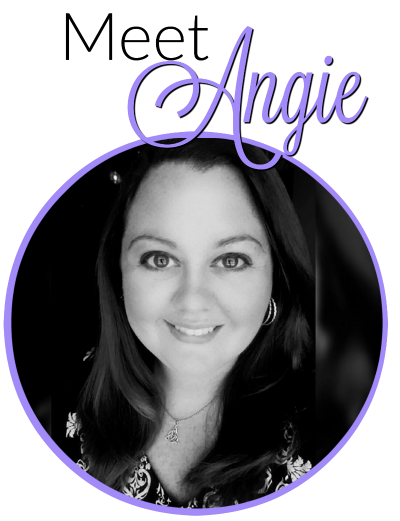 Before this year, I had never been there before but when I was younger, my heart ached for Pearl Harbor from the day we started to learn about the events that unfolded on December 7, 1941 in Pearl Harbor on the island of Oahu. I dreamed of going there. 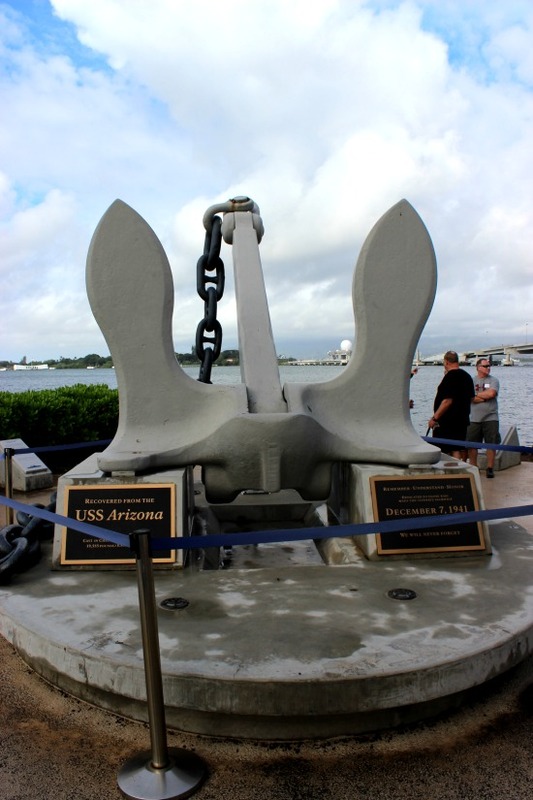 I knew that at some point I needed to see Pearl Harbor for myself and earlier this year when BigBear and I went to Hawaii for our anniversary, we made sure that we went to Pearl Harbor before we left the island! I’m so glad that Thomas and I were able to visit the USS Arizona’s resting spot and memorial when we were in Hawaii earlier this year. Truly an amazing place that put Pearl Harbor into perspective for me. It was way more emotional than I though it would be. It is something I’ll never forget. I actually had no idea that it emotional affected me the way it did until I literally had nightmares about it for the next two nights while we were in Hawaii. We saw re-printed newspapers and information boards at the memorial that had address’ of places where bombs had dropped in Honolulu, places that were not to far from our hotel…some places that I had walked by during our trip, unaware that at one point a dud bomb had landed just steps from where I was standing. We were told that in 1941 people in Honolulu & the Waikiki area could see the smoke rising from Pearl Harbor and that night as I sat on our hotel balcony that faced the direction of Pearl Harbor I just imagined the smoke filling the air and the panic that must have filled every person in the area. 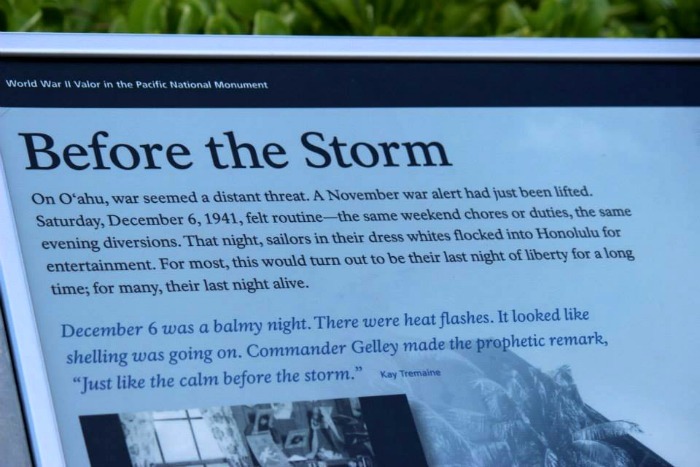 When you go to the Arizona Memorial, you can take an Self Guided Audio Tour (I highly recommend it) and before you go over to the memorial they show you a video about December 7, 1941. 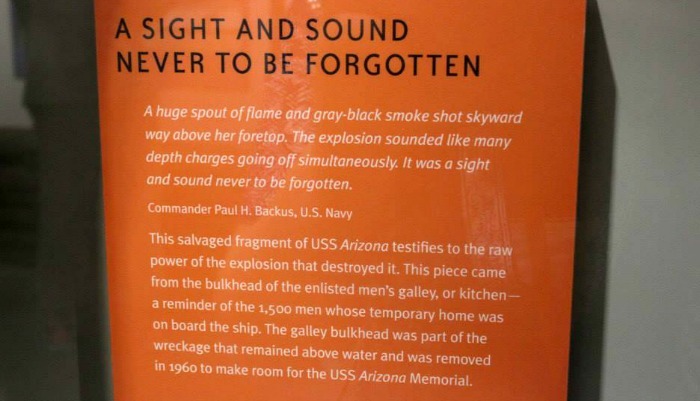 The moment in the video that shows someone filming the USS Arizona exploding, was so loud and powerful (knowing that it literally happened right outside) it literally shook my nerves. BigBear was in the US NAVY, granted he never served on a ship because he was a green-side corpsman stationed with the Marines, but he was still in the US NAVY plus His grandfather was in the Navy and My grandfather was in the Navy…..he was just as interested in visiting the memorial as I was. 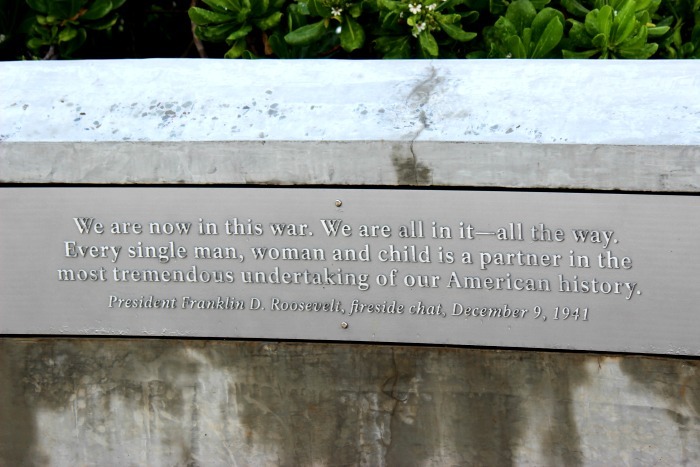 I had been waiting for the right time to share some of my photos from the USS Arizona Memorial and after sitting down today and looking back through the photos from our visit there, I thought today would be perfect. After all, today is the 73 Anniversary of the Attack on Pearl Harbor. 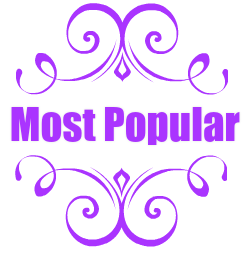 Literally as I type these words, it is “9:39 AM Sunday, December 7, 2014 (HST) – It’s 9:39 am at Pearl Harbor. 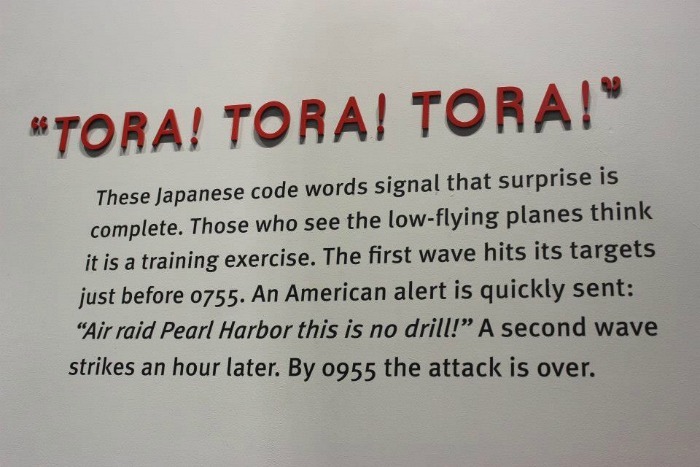 Exactly 73 years ago at this very moment, Pearl Harbor is under attack. In 20 minutes the attack will be over. 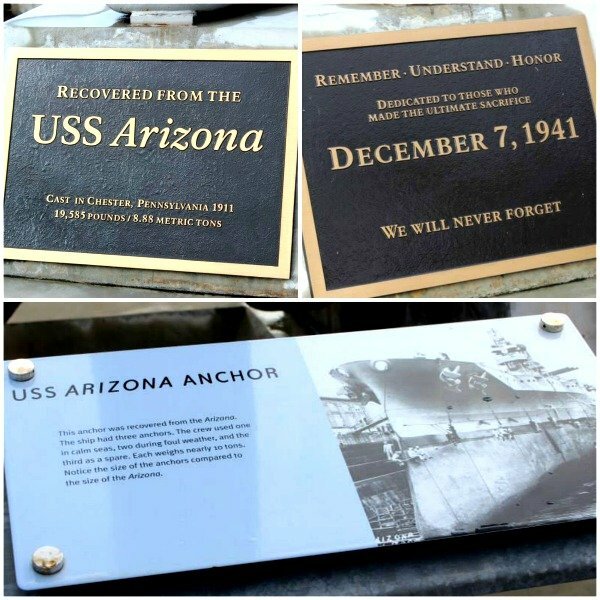 The US Arizona was sunk hour and 45 minutes ago (73 years ago). Can you imagine the terror. 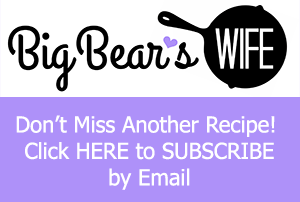 They Read– “Remember Pearl Harbor Day December 7 1941. To a nine year old farm girl that was the first huge disaster in my young life. 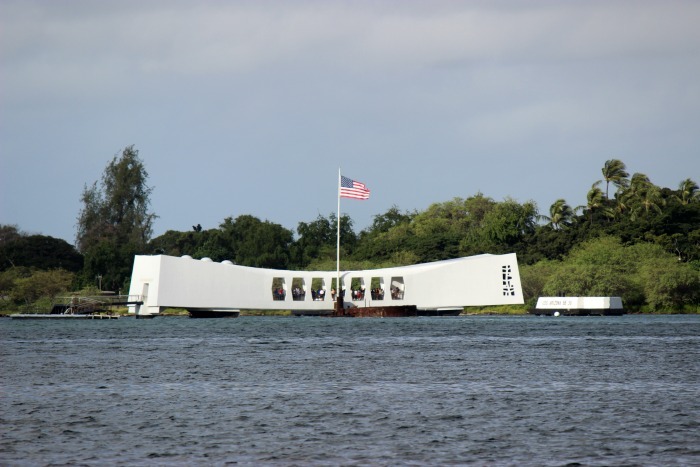 In the next 70 years I would see many more, both man made and natural, I pray the day will never come that I don’t hurt and weep for the people effected by all these disasters…..
“Remember Pearl Harbor” That was the name of a song that was written soon after December 7, 1941. It was played several times a day on the radio for the next four years. I was only 9 years old and every year on this date I remember the fear everyone tried to hide from us children. I remember the darkness, no lights showing at night. 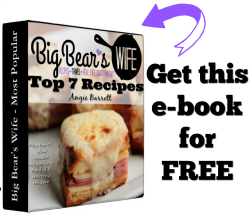 Car headlights were painted black on the top half, blackout curtains on house windows and store fronts. The generation that “remembers Pearl Harbor” grows smaller every day! 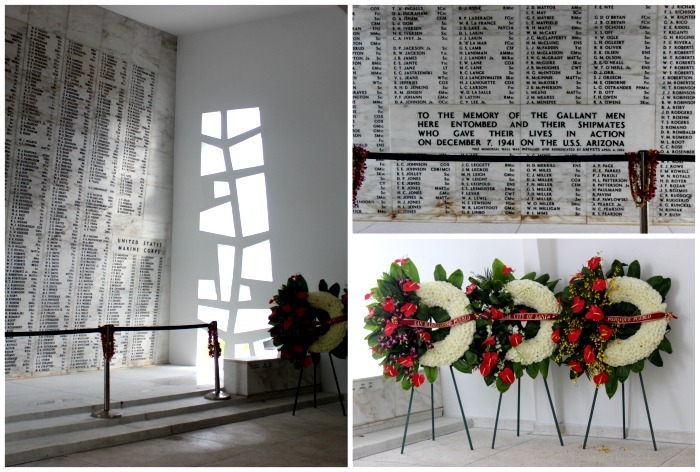 Some of the name of those lost at Pearl Harbor. TORA! TORA! TORA! — from a Sign in the Museum. A part of the Arizona that is sticking above the water. 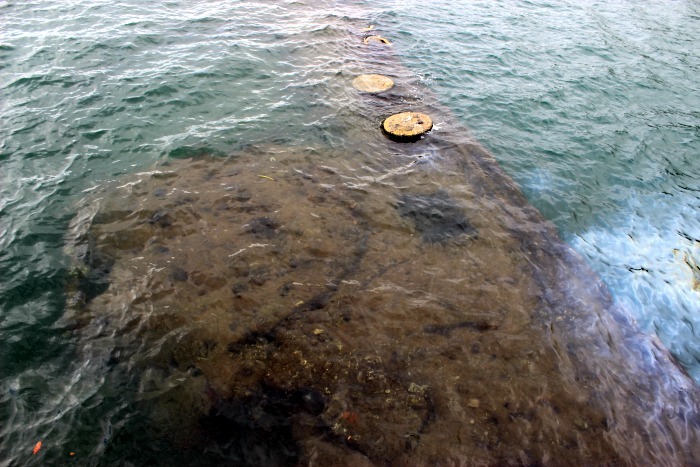 One of the most eerie parts of the Memorial…..being able to look at the water and see the massive ship (or at least parts of it) under the waves. Knowing that over 900 men were trapped in the ship right below my feet sent chills up my neck. 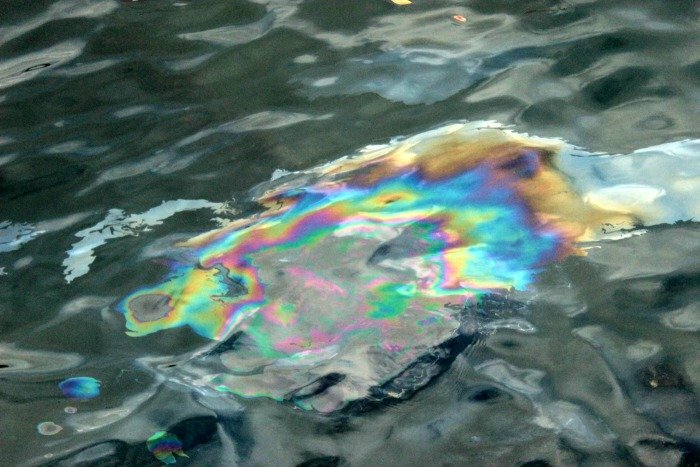 Oil is STILL leaking from the USS Arizona. 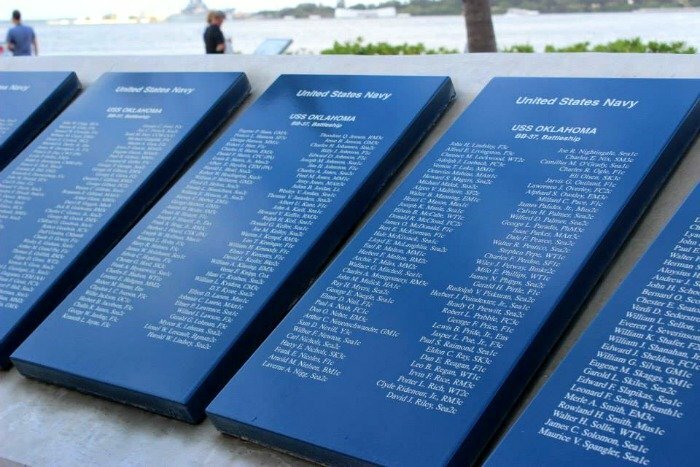 In the back of the USS Arizona Memorial there is a wall with the names of everyone lost on the USS Arizona. 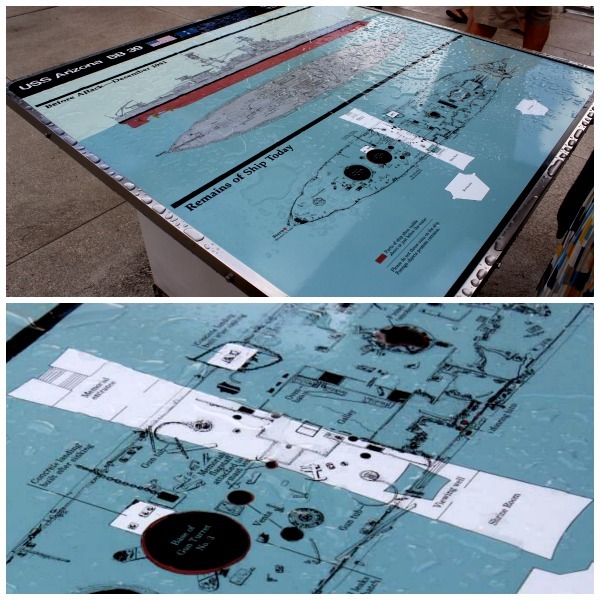 Below is a map of the ship, it also shows where the Memorial (the white part) goes across the USS Arizona that sits under the water. 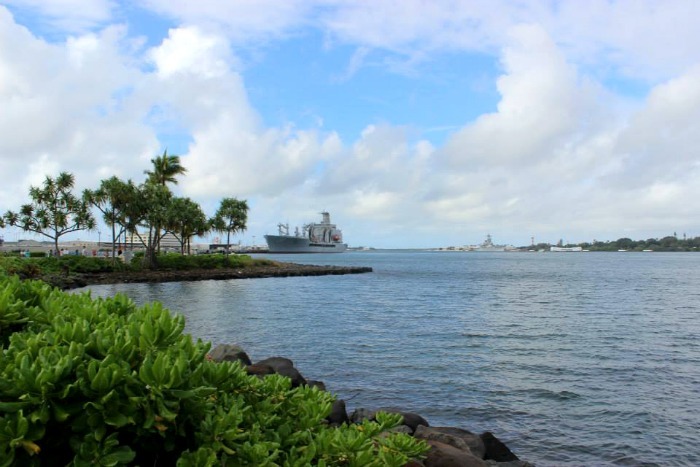 Once you visit the Memorial, the boat will bring you back to land where you can walk around and follow the Audio Tour to learn more about the attack on Pearl Harbor. 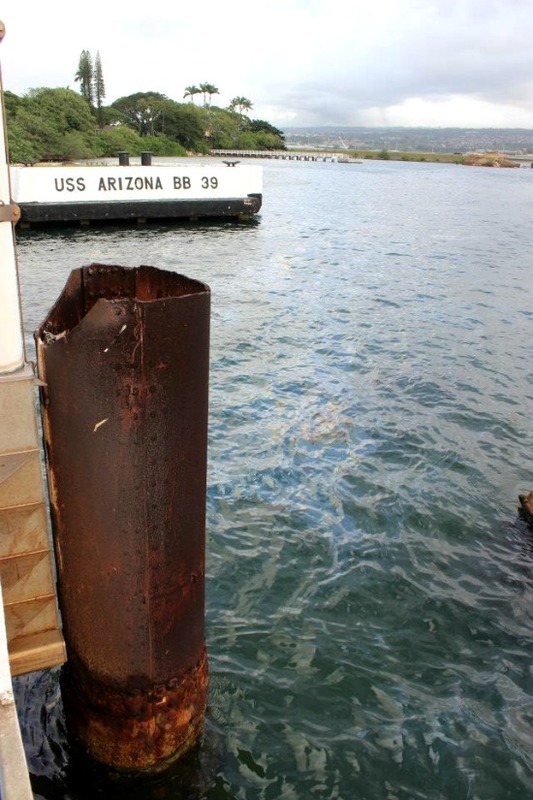 Here is the USS Arizona’s Anchor. 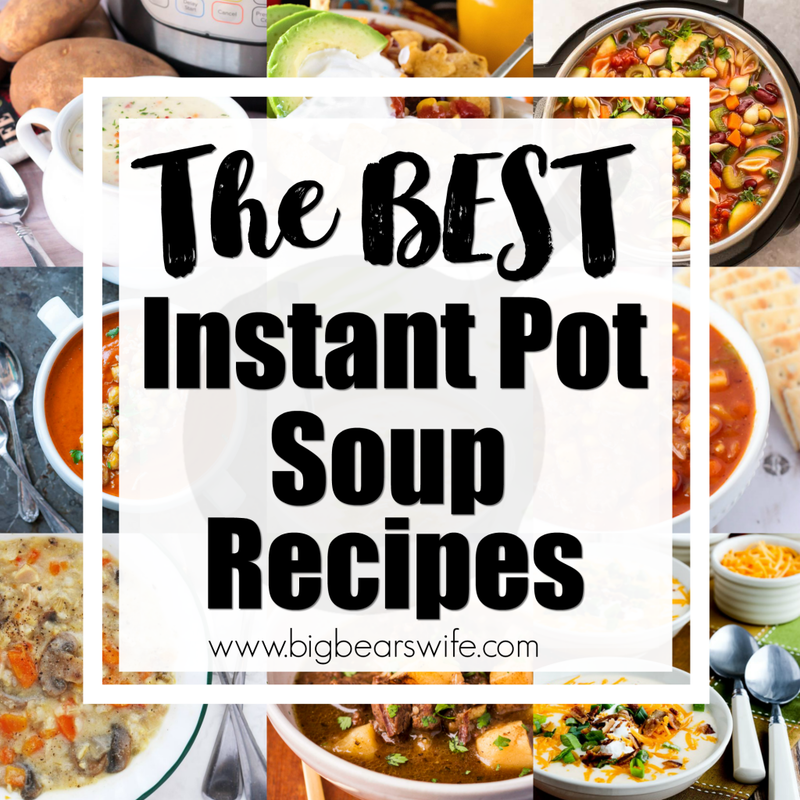 So just a few little tips before I end the post. 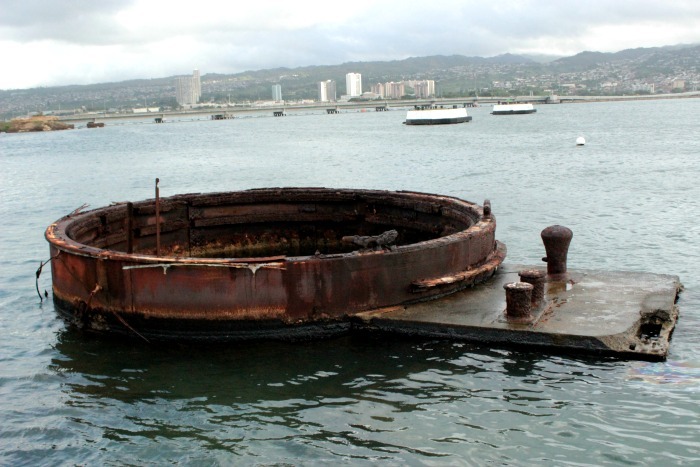 If you’re going to visit Pearl Harbor while you’re in Hawaii, DON’T pay some crazy amount of money for a Pearl Harbor tour. I heard so many tour places and even a desk person at one of our hotels, taking advantage of people by selling them $100-$300 “Pearl Harbor Tour” tickets. Pearl Harbor Ticket are free. (But they only giveaway 2,000 a day!) The personal Audio Tour was about $7 each. 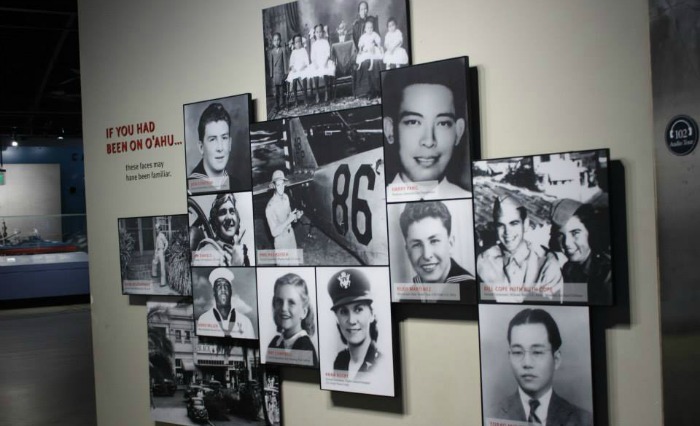 The Gates for Pearl Harbor open at 7:00am and the first tour is at 8:00 am. We got there at 6 am and we were 2nd in line! 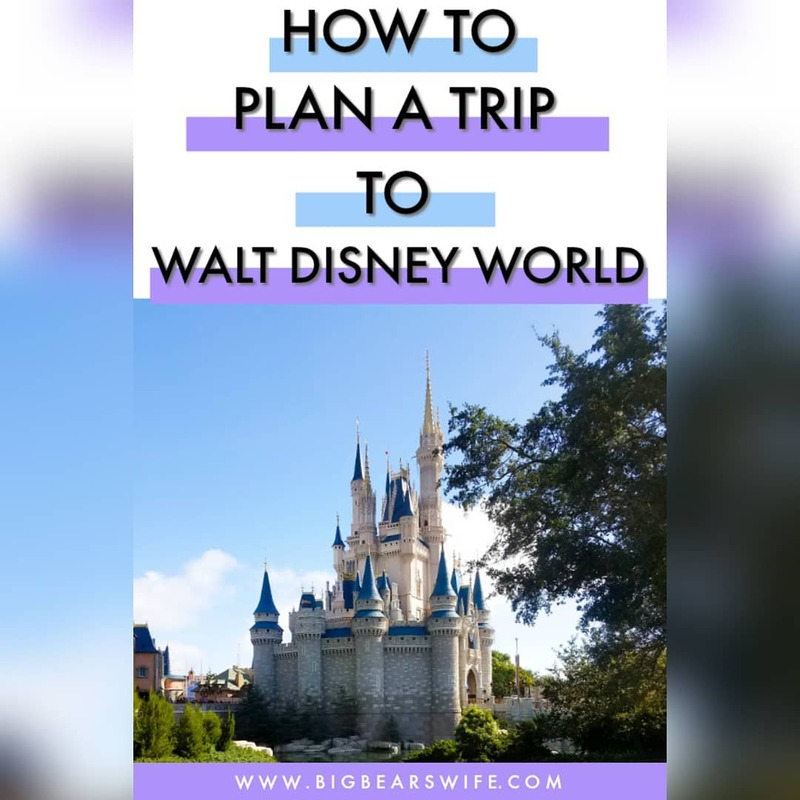 The earlier you get there, the less time you have to wait in line and the better chance you have at getting an early tour! Get there at 6am, get your ticket at 7am, go through the museum with the audio tour from 7-8 and then be on the first tour at 8am! 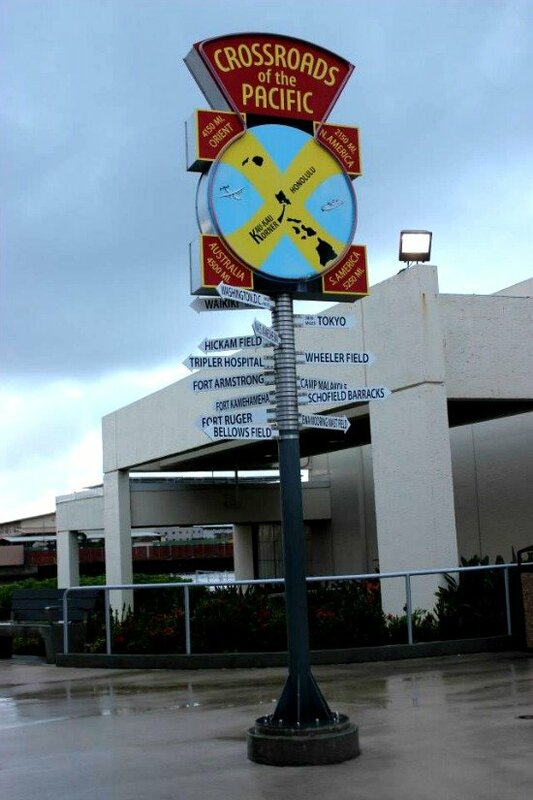 We recommend renting a car the night before so that you have it for the day you want to go to Pearl Harbor.